Finding the Best Camping Bed can be hard. There are loads to choose from and a lot of them seem almost the exact same. So I’ve put together this guide to cut through the noise and give you exactly what you need to know so you can find the best camp bed for you. Where you need one for a tent, the house or a camp bed with a little extra back support. Check out the table below for a quick run down of what’s been reviewed and just click thename to go to Amazon and order yours. Which do you think would be better for you? Air mattresses are great because they tend to be lighter because they don’t have legs and are a lot more compact. The problem is some can deflate through the night, you also need to faff about with a pump and possibly even need electricity. 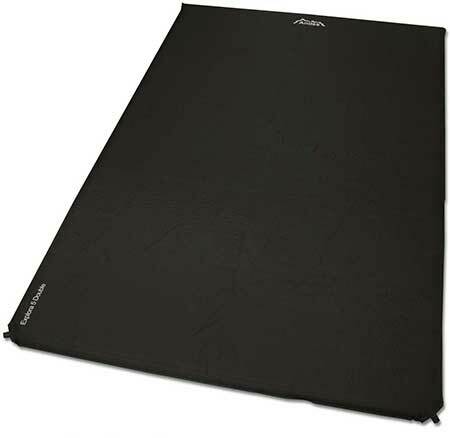 Now camp beds, on the other hand, tend to have a little more support, they’re warmer if you’re in a tent because heat can go straight through an air bed and into the ground. But some of them are heavier and can be a lot bulkier if you’re going camping. I just talk about camping beds in this article but for those interested, I have a separate article on the Best Air Beds worth checking out. Some even have legs for a best of both worlds! If your looking for the best camp bed for a tent then the weight is more of an issue that if you’re looking for one for a guest bed. You might not be walking far with it but you’ll still have to carry it some distance even if it’s just from your car to the campsite. Now if you’re wheeling it out the cupboard it’s not as much of an issue. The only time where heavier could be better is if you have a bad back. You’ll want a camp bed with lots of back support and that normally involves some sort of mattress and a hefty frame. Luckily I’ve found one of the few exceptions to that! It’s in a review further down. 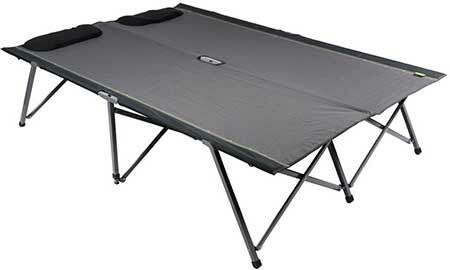 Whether you’re camping or just using it at home a camp bed has to be super easy to put up and down. You don’t want to have spent all your time fiddling with stiff latches you can’t see under torchlight. And we’ve made it to the main event! I’ve covered the best camping beds you can buy in the UK, I’ve grouped them together by what they’re best for so have a read and enjoy. If you see any you like you can just click the Price & Reviews button to see the price and order yours today. So, like I said for a tent or any sort of camping, you’re going to want lightweight, easy to pack away but you also don’t want it to be too tall so it fits comfortably inside your tent. I’ve found two camp beds that I think are perfect. Everything you need from a camp bed if you’re taking a tent. It packs down to an easy to manage 36 x 13 x 13 cm so will pack away nicely and only weight 2.2 kg so you won’t be weighed down. It sits nice and low so will fit comfortably inside of a tent. And for the price, it’s an absolute steal! Available in a range of colours too if you don’t like the black. Overall a fantastic camp bed. Now if you’re looking for the best camping beds for a bad back you’re going to want something with a little extra support. And I found just the thing you’ll want. Memory foam on a camping bed! Next levels of comofort and back support. It definitely isn’t much good if you’re heading camping because it’s about 9 kg and only folds up into a rectangle. But it’ll still fit into a tent on a campsite or it’d make a comfortable guest bed in the house. Memory foam is talked a lot about here at The Dozy Owl when I’m looking at all the different mattresses. It softens when you lie on it and moulds around your body helping keep your spine aligned and stoping pressure building up around your lower back. 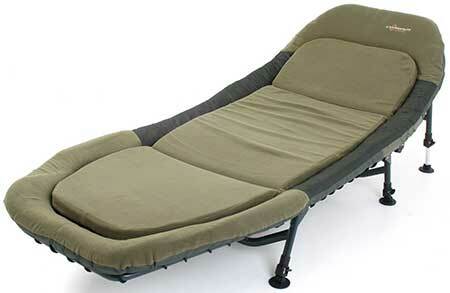 It’s actually sold as a fishing chair but it’s the ideal camping bed for back pain. Overall, without a doubt the memory foam makes this the best camping bed for anyone with a bad back. Nothing wrong with wanting to get a double camping bed so you can sleep beside your significant other! And luckily such a thing does exist in case you were wondering, I’ve found two slightly different ones I’ve shared below. Now the biggest downside to this bed is the bar that runs down the middle. Absolutlely neccesary for support if you have a raised bed but does prevent any body contact if there’s two of you in there. It’s just what you have to deal with in a raised double camp bed like this one. So if you’re looking for something more intimate check out the one below. That said, it’s a great raised camp, 100 kg each side is plenty to sleep soundly knowing it won’t explode out from under you and the 9 legs keep the whole thing stable. Overall, a good double camp bed but the bar down the middle is something to be aware of. The mat self-inflates by taking off the valve and it draws air into it, but to get it fully firm you’ll definitely need to top it up manually, just a couple of extra big puffs should do the trick. It’s 5 cm thick which is enough to keep you up without feeling the ground underneath but does leave it with a really firm feel. When it’s deflated it rolls up nicely and fits into a carry bag, it weighs around 4 kg so it’s not the lightest but not outrageously heavy either. Mainly, it’s ideal for couples because there’s no middle barrier and no weight limit so could hold up even with two people on one side. Overall, the best camping bed for couples, loads of space to move and strong enough for two. Finally we have the best camping bed for guests, it would be absolutely useless out camping but as a spare bed to roll out the cupboard on occasion it’s ideal. 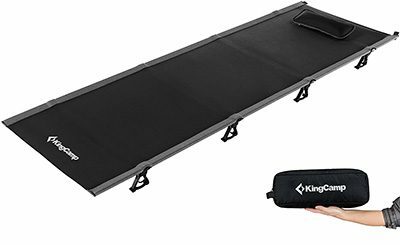 This is probably the comfiest camping bed on the list, but it is also the least useful for camping! Irony at work. 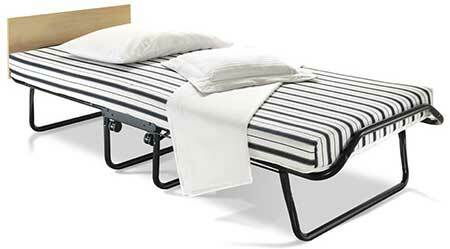 But if you need a camp bed to use as a spare guest bed then it’s ideal. It folds up with the mattress onto a set of four wheels so you can roll it into the cupboard. 8 legs keep it very balanced and the slats are nice and wide which keeps the mattress propped up so you can stay comfortable. 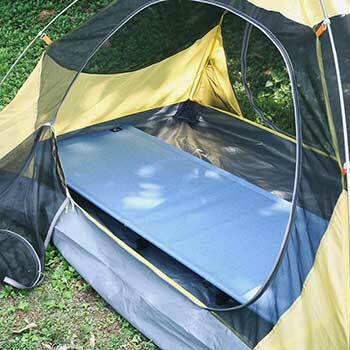 Overall, a great camping bed to have in the house, comfortable and practical.